This is the view from my balcony towards the west, last week. It was a particularly beautiful sunset. The big building on the right is the Ebisu Garden Tower. The one on the left is the Westin Hotel. It looks like the sun has split the hotel in the middle, but it’s just a spotlight that illuminates a corner of the building. 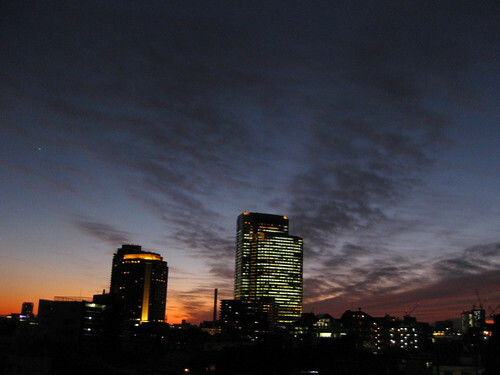 The buildings are the two most prominent at the Ebisu Garden Place. The Westin is a gorgeous, luxury hotel. I sometimes go there to read or write in their lush lobbies. On the second floor, there are loads of comfortable, baroque sofas, chairs, and lamps that are bolted down. I learned early in life that if you walk into any place like you belong, no one bothers you. It’s one of my things: I like walking into buildings I have no business being in. The Tower is one of the best places in Tokyo for a great view. It’s free to go to the top, in the express glass elevators. The top two floors have restaurants, many of them very reasonable. And they are ever so romantic. I’m really into views. Whenever I go apartment or house hunting, I instinctively go straight to the windows to see what I can see. Only then do I check out the inside of the place. The apartment could be great, but if the view is another nearby building, I feel claustrophobic. It’s no accident that I’ve lived in lots of places with great views. The following is the top 5. 1. Monterey Bay. I lived in a beach house for a couple years in Santa Cruz, California. My bedroom had sliding glass doors that opened into a balcony that faced the bay and the Pacific Ocean. There was a spectacular sunset over the waters every evening. It sounds tranquil, and it mostly was, except that I lived with anywhere from 6 to 8 other people in that huge house. 2. The Bradford City Town Hall and Clock Tower. When T and I lived in England, we had this corner apartment in a building that was newly converted from a post office. It was right across the street from the main city centre plaza. The town hall and clock tower are Gothic, Italianate works of art. It was a joy to wake up to great architecture every morning. AND we always knew what time it was. Although, the clock was anywhere from 2 to 3 minutes late. And since the whole city set its time to the clock, the entire town was always a few minutes late. 3. The Willamette River. From the balcony of this Oregon townhouse, I could see a spacious rolling lawn, a humongous tree that shaded the entire lawn, a bike path, and the forested banks of the river. This might be one of the best places I’d ever lived in. There was a pool and jacuzzi, and a community garden. There was also a lot of active wildlife. Marauding squirrels gnawed through any kind of container possibly containing food left on the balcony. And dueling raccoons often hissed through the night. 4. Tokyo City Lights. After a day jostling in the urban crowds, it’s nice to go home and rise above the fray. Sometimes, me and the missus turn off the lights, sit on the couch, and chill out, looking out over the sparkling city lights. One of my favorite household chores is hanging the laundry on the balcony while drinking a beer. 5. A Redwood Forest. When I lived on campus in Santa Cruz, I lived in these dorms that were among the redwoods. The buildings were Mondrian, post-modern, whimsical, with lots of windows. I felt like I lived in an Ewok village. Unfortunately, it was one of the worst living situations I’d ever been in. But I guess it was a typical college dorm with decomposing pizza boxes, and beer can monuments. I have a knack for finding a place with a great view. It’s because my eyes demand that they not be aggravated by uninspiring visions, and because my mind requires a lot of space.